Real Name: Gabrielle First Appearance: Spawn #9 Powers/Abilities: As an angel, Gabrielle possesses the customary powers of the Heavenly host, including superhuman strength, and mastery over many fighting styles and weapons. Orgin: Gabrielle was born in Heaven, and raised as one of its soldiers. What's The Story? : An administrative angel, Gabrielle was the head of Terran affairs for many years, overseeing Heavenly activity on Earth, and monitoring the Earthly activities of Hell as well. Over the years, Gabrielle developed a deep hatred for the hunter Angela. 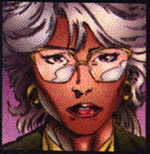 As an indirect result of Angela's first encounter with the current Spawn, Gabrielle framed Angela for a crime she did not commit. Her scheme was eventually discovered, and Gabrielle was relieved of her office by Rafael.